There are plenty of iPad case manufacturers out there that claim their cases are made for kids. Some have done exhaustive testing and deemed that yes they could be put to the test, and some have been implemented in classrooms and lived up to their claim. 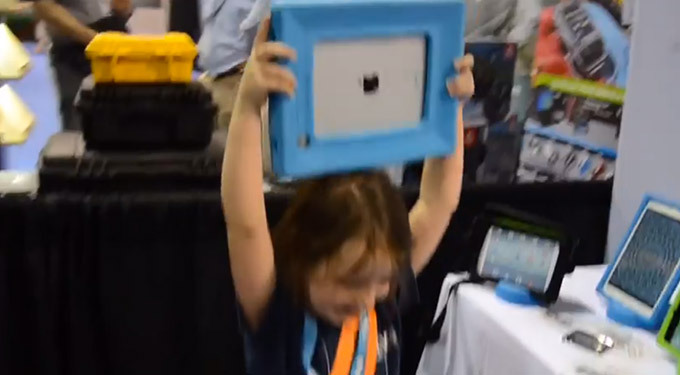 Our six year old special correspondent Tatum got a chance to check out a few “kid proof” iPad cases at ISTE 2014. Big Grips was one of those cases. The BigGrips case is designed to withstand the beating of any school age child but their perfect for early ed K-2. The foam that surrounds the iPad is similar to the foam found on running shoes. Big Grips has even designed a stand to support the cases bigger, bulkier frame. Because the Big Grips cases are made of foam, they don’t add as much weight as you think. They’re both light and shock absorbing. Some of the commercially available cases that claim to be tough are made with tough materials. From a big fall the case may make it just fine, but the impact of the drop or crash may prove to be too much for the tablet itself, as we once experienced. BigGrips absorb the shock and protect the iPad or tablet.